Summary: Miss Hayes has a new theory. She thinks my condition’s caused by some traumatic incident from my past I keep deep-rooted in my mind. As soon as I come clean I’ll flood out all these tears and it’ll all be ok and I won’t be scared of Them anymore. The truth is I can’t think of any single traumatic childhood incident to tell her. I mean, there are plenty of bad memories – Herb’s death, or the time I bit the hole in my tongue, or Finners Island, out on the boat with Sarah – but none of these are what caused the phobia. I’ve always had it. It’s Them. I’m just scared of Them. It’s that simple. I picked up Alice and the Fly not to long as a spontaneous purchase. I’ve been trying very hard not to just pick up random books that I’ve not researched in to, because chances are I’ll lose interest very quickly and it would be once big waste of money. But the cover stood out to me and the story sounded interesting so I thought I’d give it a go. Alice and the Fly follows Greg, a school boy who suffers from schizophrenia. He’s an outcast at school and doesn’t have any friends after everyone found about his mental health. However he has a rather large crush on a girl called Alice. He writes to Alice every day. The story unfolds with snippets of police interviews from his family, hinting that Greg has done something very wrong. I didn’t know what to expect from this novel when I picked it up, and it did take me a little while to get in to the style. It is definitely adult fiction, but from the point of view of a teenager and set mainly in a school, I found that very strange. You only realise later on in the book that the theme and the unfolding storyline is what makes it adult fiction. Once you get over the strange genre changes, it gets quite interesting. 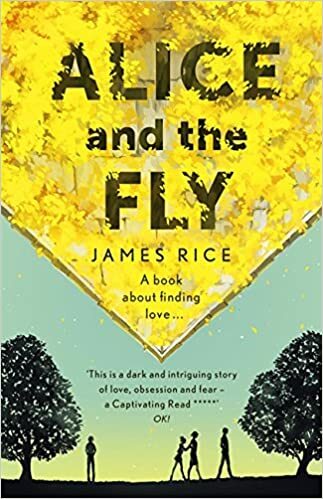 Considering this is James Rice’s first novel, it was incredibly written. The writing kept you interested, whereas the story was well thought out and kept you guessing what was going to happen next. I was very impressed. The whole novel played out as somewhat of a crime novel. It was a constant question of what happened to who and when. This was not what I was expecting of the novel at all but was a very welcome surprise. I loved that aspect of it. I’ve not read many books that deal with schizophrenia, and I always assumed it was a tough topic to cover. Because of this I can’t really tell if it was dealt with well or not. I appreciated the detail of Greg’s fits when he was having hallucinations, however I’m just not sure if this was the most relatable or helpful rendition of the condition. The one thing that I didn’t enjoy about this novel was the amount of characters that seem to be pushed in to it. I enjoyed the back stories of Greg’s parents and his sister. However there seemed to be a lot of names thrown around of kids that went to his school. It took me a good half of the book to understand who was who and who did what. By the end I think I kind of understood the school dynamic but it just wasn’t very well portrayed. Overall I’m pretty glad I picked up Alice and the Fly, it was a very interesting read that kept you guessing what was going to happen next. It won’t be making it in to my favourite books list any time soon, and it’s probably not going to be a re-read. But if you like a story to keep you guessing with interesting protagonists, then this is definitely for you.